Gardening With Nature: Now let's see...what was I gonna do next? I start my day in the garden by taking my cup out to the table under the sycamore tree and sitting and sipping while I think. As I sit, Charlie, the garden cat, jumps on my lap and demands attention so I include stroking him into my cycle of sitting and sipping and thinking about what I'm going to do today. Charlie, taking a drink from the little fountain in the backyard. Charlie and his mother turned up in our yard 13 years ago, abandoned. Charlie and his four littermates may have been born in the wild. They were perhaps four months old before they came to me and I gave them shelter in our garage. The kittens were never completely socialized and could not be inside cats but we kept Charlie as an outside cat along with his mother, Clara, who died just over a year ago at around (we're not sure) 18 years of age. Charlie has been my main garden "helper" all the years of his life. At length, I decide that today will be the day that I move some plants, starting with the 'Lucifer' cannas. I'm going to move them from their bed to the tubs on either side of the bamboo fountain. To that end, I evict Charlie from my lap and head out to the garden shed to get my tools. On my way to the shed, I happen to glance at the little 'Gulf Rose' plum tree that I planted last week and I'm not happy with what I see. It seems to be leaning south at an almost 45 degree angle. I don't remember it leaning that much when I planted it. It needs a stake to hold it vertical until its roots are well-set. I detour to the potting table to pick up a bamboo stake and some garden twine, open the shed and grab the hammer, and proceed to pound the stake into the ground next to the tree and tie it so that it stands straight. Much better! While I'm working, I notice that several leaves are about to burst out. I don't see anything that I recognize as flower buds. While I'm in that part of the garden, I decide to check on my other plum tree nearby, the one that I planted last year. The poor thing struggled mightily in the terrible drought of last summer and it eventually lost a couple of limbs, but it survived, and now it looks healthy and has a few leaves already. It's even grown a bit taller since last year. I return my tools and pick up my shovel from the shed. Walking through the veggie garden on my way to dig the cannas, I notice that the sugar snap pea bed really needs some weeding, so I put the shovel down and start pulling weeds. Twenty minutes later the bed is clean. One of the posts holding the trellis on which the peas grow also holds a bluebird nesting box. I open the box to check it and find a layer of green moss at the bottom of the box. This means the Carolina Chickadees are building a nest there, but I've seen House Sparrows going in and out of the box, too. They'll destroy the chickadees' nest unless I find some way to stop them. I need some way to reduce the size of the hole so that only the chickadees can enter. I'll have to assign the problem to my bird box engineer. Walking farther through the garden, I notice that one of the pepper plants that I planted yesterday is lying flat on the ground. I pick it up and see that it has been broken off just above soil level. This is the third plant that this has happened to so far. At first, I suspected Charlie of rolling on the plants - he does have an unfortunate habit of doing that - but I'm beginning to wonder if I have a cutworm problem. I dig in the soil around the broken plant but do not see a worm, so the mystery remains. I stop by the bed where I've planted my kumquat tree and pick one of the tasty fruits to munch. I've been grazing on this tree for months now, but the fruits are almost gone. There are fewer than ten left and the new bloom buds are beginning to form. I'm considering buying another kumquat tree for the garden. I really am addicted to these little fruits. Next I stop by the potato bed to see how many potatoes have made it to daylight. I count fifteen plants, which is a little more than half of what I planted. I find that it can take a couple of weeks sometime before all the potatoes are up, but they are definitely worth waiting for. Nothing like new red potatoes fresh from the garden! Finally, I arrive at the bed where the cannas are and proceed to dig them up. The roots have multiplied in the two years that they have been in this bed and there are several to transport to their new home in the tubs. As I'm planting the canna roots in the tub, I notice that some of the gerberas planted there have fat buds on them. 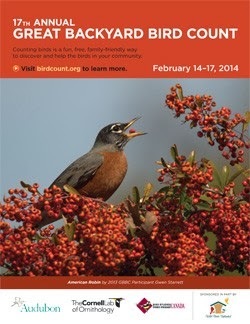 They'll be blooming soon. By now, my back with its degenerated disc is yelling at me. Time to sit for a bit. Back to my chair and here comes Charlie for his second helping of attention. 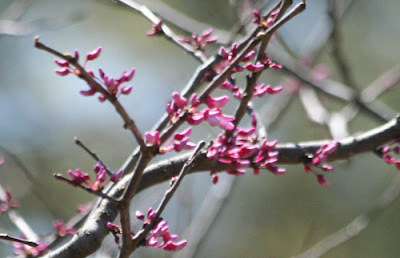 As I'm sitting there, gazing at the scene in front of me, I suddenly realize that there are blooms on my redbud tree! Surely these little blossoms were not there yesterday. They popped out overnight when I wasn't looking. I notice that the ficus tree in the pot by the back porch has a dead section that really needs to be pruned away, so I whip out my Felcos and have at it. 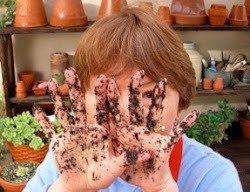 Then I decide that the pot needs some more soil, so I head back to the potting table to scoop some into a bucket. Adding the soil to the ficus pot, I notice that the nearby pot of purslane that has overwintered on the back porch needs to be trimmed back, also. As I'm trimming, I try to think of some way I can discourage Charlie from curling up in this pot. All the purslane is mashed down from his 14 pounds. Another job for my bird box/garden engineer to figure out. And so goes my day in the garden. Never in a linear fashion, it zigs and zags all over the place. It really is a wonder that I ever get anything done! Hahaha Dorothy! My whole life is like that, it seems! It *is* amazing we get anything done isn't it? Your day sounds perfect. Yes, I admit that it's not just my gardening that zigs and zags all over the place, Jayne. I'm afraid it's just me all over. Sounds like my kind of day in the garden! I am sure I have some sort of plan when I start but I get easily distracted. I don't think I have ever eaten a kumquat. What do they taste like? They are citrusy, a combination of sour and sweet, Karin. Sometimes I pick one that ranges on the sweet side and sometimes on the sour, so there's that little bit of uncertainty about what you're going to get each time. They look like very small oranges and you pop them into your mouth, skin and all. Delicious! The pump and water tubing sit in the pot under rocks and the electric cord is run to the outlet on the back porch and is hidden by rocks and, in some places, mulch, J.C. It works for me and I'm fond of the little fountain, too.